Most women don't realize the importance of preparation before conceiving. In fact, it takes 90 days for your eggs to mature and be selected for ovulation. You may be frustrated you're not getting pregnant as quickly as you'd hoped. Maybe anxiety has crept in as you wonder, "Will it ever happen?" But have you taken the necessary measures in the last 90 days to prepare for conceiving? Age alone isn’t the key factor to your pregnancy potential, but rather it’s about how you treat your body. Your choices can either speed up or reverse your egg aging process. The good news is that means you can turn back the clock to some extent by giving your body what it needs to restore it’s reproductive health. What’s the first thing you need? Patience. Enough patience, that is, to last you at least 90 days. I know it sounds totally backwards to wait 90 days to get pregnant when you’re fighting against time, but it’s what you do with those 90 days that makes all the difference. When your mom was pregnant with you, you inherited your lifetime supply of eggs at around 18-22 weeks of gestation. At this point you had millions of eggs called primordial follicles. Only the loveliest of your eggs move forward in the elimination rounds over the course of 3-6 months before ovulation. During these months, they compete for their chance to join the final group of antral follicles; these are the eggs in waiting at the beginning of your present cycle. The prettiest and healthiest of these eggs will be chosen to ovulate and possibly be your future offspring. These 3-6 months are crucial. Your eggs depend on nutritional support and a healthy environment as they struggle to stay viable and thrive through many challenges. So now you can understand the difficult journey your champion egg has gone through by the time it’s ovulated. It's no coincidence that I see much higher IVF success rates and much lower miscarriage rates when a woman takes the time to prepare her body using my methods for at least 3 months beforehand. Likewise most women working with me who are trying to conceive naturally share the good news of a positive test within the 3-6 month window after they started using my program. What can you do over 90 days to give your eggs their best shot? Stop with the excuses already! You CAN make the time. You MUST make the time! I know I'm sounding backwards again, but the less you do the more you get done! We kid ourselves into thinking that just because we’re busy we’re being productive. Have you ever come back from a vacation and noticed how productive you were? You think so much more clearly when you’re relaxed. Take mini-vacations throughout your day. If you plan on having a kid, you’ll make the time for him or her right? Make the time for you now. Take time to rest. To read. To listen to music. To pet your cat. To walk in nature. To talk with loved ones. To contemplate. To daydream. To deal with the emotional baggage that’s stressing you out. To paint. To sing. To splash in a puddle. To stare at the wall. It may be as easy as taking 5 minute breaks throughout your day at work. Take a few moments to focus on your breath, listen to a guided meditation, your favorite relaxing song or a quick comedy routine. What you may not realize is that you can stimulate pressure points at home to improve egg quality, promote ovulation, and support implantation and pregnancy. Pressure point activation involves applying pressure with your fingers to specific trigger points on your body which sends messages to through your nervous system to your reproductive organs thereby improving circulation to balance your whole health and fertility. 15 minutes a day makes a huge difference. 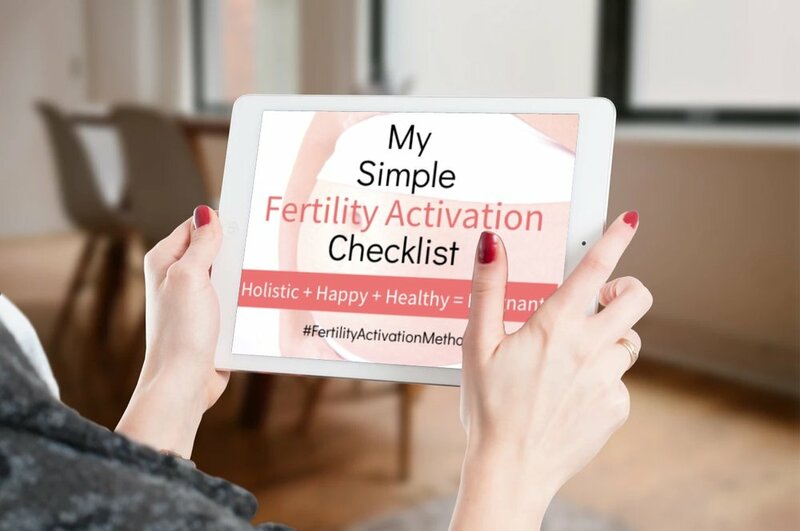 When you activate a powerful combination of expertly chosen fertility pressure points, like the ones in my online program, Fertility Activation Method, you greatly impact your reproductive health. Some points specifically direct blood flow to the ovaries and uterus. Other points support your digestion so you can absorb nutrients. While others balance your hormones, improve blood flow and reduce stress. The points each have an individual effect but when used together in the right combination, they stimulate an even stronger energetic surge that will help restore egg quality and support your reproductive organs. By activating fertility pressure points regularly, you can create healthier patterns in your body that keep building on each other to preserve healthy DNA, balance hormones and support your eggs during their journey. No matter how healthy you eat, chances are you're not perfect. That's why taking nutritional supplements helps to fill in the gaps and provide your body with the nutrients needed to support egg quality and repair DNA. You can learn more about my supplement recommendations HERE. Heidi Brockmyre is an acupuncturist, herbalist and fertility and pregnancy specialist with a background in Chinese medicine. She has over 10 years of experience helping women grow their families. She's supported hundreds of women in her clinic in San Diego, and thousands of women around the world in her online community. Heidi focuses on helping women create total fertility wellness by preparing the mind, body, and spirit for fertility and pregnancy through her virtual fertility self-acupressure programs.